Can this new delay pedal topple Line 6's DL4? If you use delay as part of your sound, the Flashback X4 is a very practical and creative pedal to cover all your needs. Easily programmed. Range of delay effects. Three delays always available. Upgradeable with TonePrints. Modulation not instantly adjustable in the w/Mod settings. So, you use a delay pedal on stage - how many sounds do you need in an average set? We reckon most guitar players who use delay would prefer more than one sound: perhaps a tape-echo simulation as well as a cleaner sounding digital delay, and maybe some modulation on the repeats - not to mention being able to alter the delay time to suit tempos. Line 6 recognised that need long ago and supplied the functionality in the DL4, a pedal that has stood the test of time, so much so that Line 6 hasn't replaced nor upgraded it in 12 years. With three footswitchable delays plus tap tempo in a single pedal, the DL4's configuration offers such obvious practicality that the urge to offer something similar has finally proved too tempting, resulting in Vox's recent DelayLab. 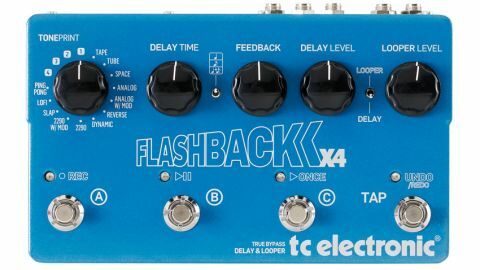 Now, TC Electronic has chipped in with the Flashback X4 featuring - yep, you guessed right - those three instantly footswitchable delays plus tap tempo. "TC has gone for the infinitely upgradeable route by using its TonePrint technology in the X4"
Where Vox upped the ante with the DelayLab by providing 30 programmable memories, TC has gone for the infinitely upgradeable route by using its TonePrint technology in the X4. In case you're not aware of the concept as yet, TonePrints are developed by TC and the artists involved with them, using specially developed tuning software that allows both the company and the artist to tweak internal parameters in the pedals to create sounds you wouldn't get from turning the knobs. These TonePrints are available for free on TC's website and can be loaded onto the pedal via computer or smartphone. You can have four instantly selectable TonePrints in the X4, with the option of swapping them for any others. "Based on TC's original Flashback delay pedal, the X4 is around four times the size, but still compact considering its functionality"
Based on TC's original Flashback delay pedal, the X4 is around four times the size, but still compact considering the functionality it packs in. Its knobs are chunky and larger than the single pedal's, and thus may lend themselves to onstage manipulation by foot, although adding an expression pedal will yield more accurate results. For each preset, an expression pedal can be set up to tweak single or multiple parameters - any combination of delay time, feedback level and delay level, with the possibility of setting a separate range for each. Four footswitches control the action in delay mode: the first three are used to recall the three presets A, B and C, while the fourth is a tap tempo switch that sets delay times. A two-way toggle switch selects between delay and looper operation. The looper can be used with a dialled-in delay sound active, and it's simple to use, with the footswitches offering record, play/stop, once (single play) and undo/redo functions. The X4 expands on the delay types found in the original Flashback pedal, and not just with four TonePrints instead of one. Of the 12 built-in types, there are now two modulated delays plus a couple of extra retro types - Tube and Space. You can choose your delay type from a rotary knob, and then tweak its parameters using the delay time, feedback and delay level knobs. "You can assign your delay sound to footswitch A, B or C by simply holding the footswitch down"
In addition, the subdivision switch allows you to select regular quarter notes, dotted eighths/triplets or quarter notes plus dotted eighths. Finally, you can assign your delay sound to footswitch A, B or C by simply holding the footswitch down. The cleaner digital delays are based on TC's legendary 2290 delay unit and deliver pristine repeats. One of the two available types is straight-down-the-line delay, but the second adds modulation in the form of chorusing on the repeats. A similar trick is carried out with the Analog delay, where you get emulations of old-school bucket brigade delay, one that's not messed with and the other modulated. The amount and type of modulation on each of the modulated delay programs is fixed, and it's an obvious effect that works well if you like that epic sound, but may be laid on a little thick for some - you'll have to look to the TonePrints for more subtlety, because some of those available tone it down, and some feature flanging rather than chorus. "The tape echoes are all subtly different, with successive repeats that change tonally"
Tape, Tube and Space all offer variations on tape echo simulation, with Tube tweaked to sound like a valve-powered Echoplex, and Space aiming to emulate a Roland Space Echo. These are all subtly different, with successive repeats that change tonally and in terms of how distorted/broken up they become. The LoFi setting has a similar set of crusty repeats, and the four programs provide repeats that melt naturally into your overall sound, all with some of the vibe of a multi-head machine if you select that quarter/dotted eighths subdivision setting. Of the rest, Slap offers a very short slapback, ideal for country and rockabilly, while Reverse offers some effective weirdness once you've got the hang of it - turn the feedback fully down and you'll get reversed sound only. The Dynamic setting is designed to keep your sound free of delay clutter while you play, and if you try Ping Pong with a stereo output, the repeats bounce back and forth between the speakers. "There's a fine selection of basic delay types, but with the TonePrints, another world beckons"
Overall, there's a fine selection of basic delay types to keep most users happy, but with the TonePrints, another world beckons. At the time of writing, the TC website is hosting a wide selection of over 70 delay TonePrints, some of the latest coming from the likes of Joe Perry and James 'Munky' Shaffer among others, plus an emulation of a Boss DM-3 from American retailer Sweetwater. While some don't stray too far from what you can dial in with the Flashback knobs, many are very creative and well worth seeking out. And, talking of creative, there's plenty you can do by simply plugging in an expression pedal. Without doubt, the X4 is a pedal with loads of sonic potential waiting to be unlocked. The combination of three different, instantly selectable delays plus tap tempo has proved to be an extremely practical configuration for any delay pedal, and the X4 carries on that tradition while adding something new. It's a very easy pedal to set up and use, and very reasonably priced (especially in relation to the original Flashback). However, it may just be the TonePrint feature, which provides a near-constant supply of fresh sounds stretching out into the future, that will give it a more universal appeal, and perhaps the sort of longevity that the DL4 has enjoyed.